Memories happen in all kinds of places. In dreams, places are stitched together to form a new fabric altogether. The reinvented spaces of dreams restage memory and upstage the familiar, often revealing a new truth. This is the sort of woodland space that our eyes are invited to wander through in Donald Beal’s newest landscape paintings. 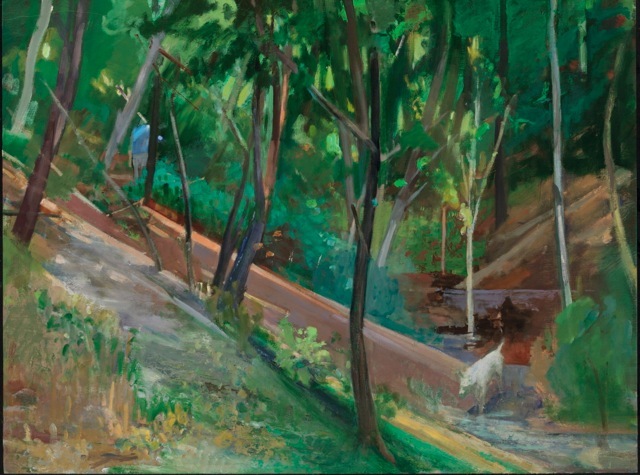 In some of these works, we follow dogs running through or pausing in wooded landscapes, illuminated by slashes of sunlight that reach the ground. 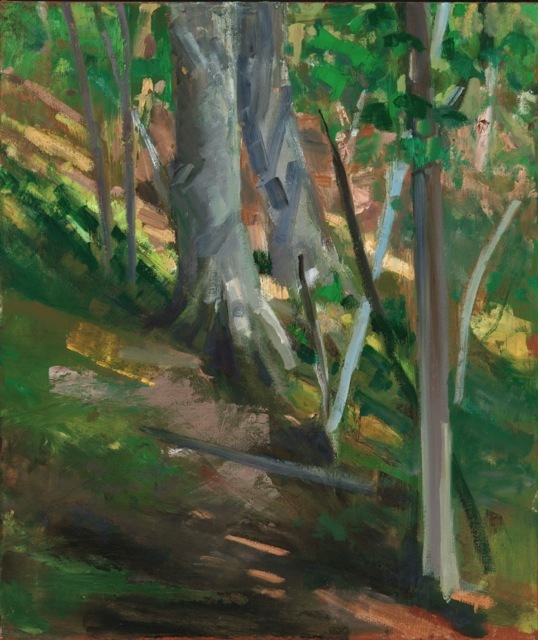 Provincetown’s Beech Forest is most often the place evoked, which is to say that these works are based on observed phenomena and physical elements of this unusual landscape to which the artist has repeatedly returned. Beal selects diagonal elements in the landscape, earth that either built up or slid down so long ago that it is seemingly motionless now, as we witness this place in our slice of time. Against these old structures of tilted land, trees that struggle upward for verticality invite us to thread a path through them. The unfocused chaos of thickets sometimes blocks our passage, and other lines of sight draw our attention down into mysterious ravines. A waterfall or a large tree becomes a vital, almost sentient presence, a personality encountered in the landscape. 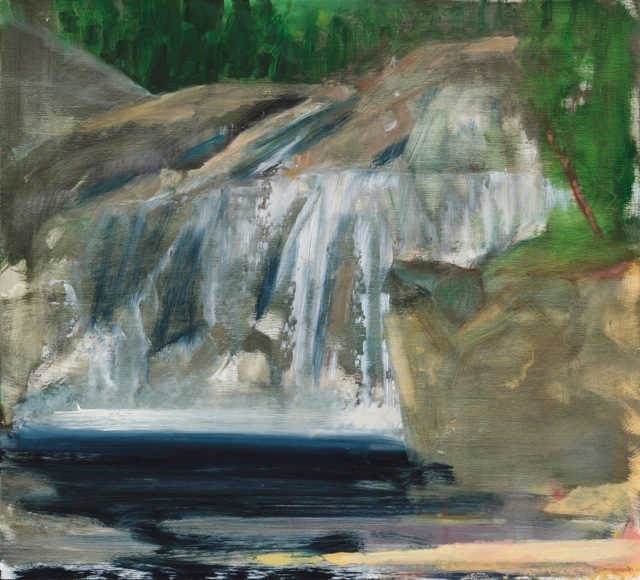 Beal’s paintings are inventions assembled –in a most unconscious way– of collected bits of dreams, scraps of memories, and years of painting this place; painting and un-painting, scraping off and repainting this specific Beech Forest landscape. In this associational process, formal relationships between the elements of landscape emerge, bringing to the surface gleanings from the language of landscape painting from Poussin, Corot, Courbet and Cézanne to the abstracted planes of DeKooning that so often suggest the spaces of landscape. 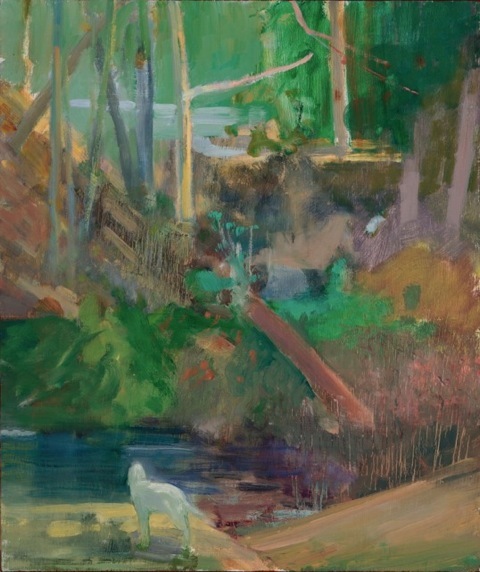 Degas advised working from remembered vignettes because “imagination collaborates with memory;” in this way, Beal’s recent landscapes evoke our physical and visual sensations of moving through nature and then later meditating upon our recollected moments. 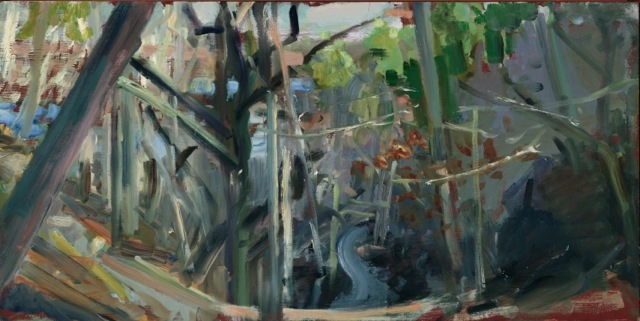 This show will be on view at the A-Gallery in Provincetown, Mass. Aug. 14-20 2013.